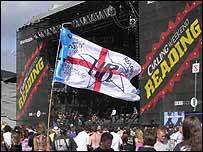 Blur, Linkin Park and Metallica rocked the Reading Festival, one of the major UK music events of the summer season, which ended on Sunday. When Blur last appeared at the Reading Festival four years ago, they suggested the band were on their last legs. But it was a re-born Blur that headlined on Saturday night. They mixed tracks from the new album, Think Tank, with well-known tracks like Song Two and Girls and Boys. 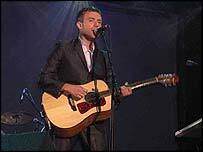 Claiming he was not being sentimental, Albarn pointed out that one song had been co-written by former guitarist Graham Coxon. The only minor slip came when Albarn took a tumble as he got off the stage to get closer to the crowd. Filling in for the injured White Stripes before Saturday's headliners, Black Rebel Motorcycle Club gave everything expected from a leather-clad band - but also showed they had a softer side. In the afternoon sunshine, the Libertines got straight down to some late 1970s punk rock while Mike Skinner from The Streets told the crowd he had lost his mojo and went off to find it. When he came back, he had also managed to find a few cans and bottles which he indulged in as his rap and poetry was set against a funk, blues and reggae background. Though not the most exciting looking band, the Doves showed that Manchester rockers can still be popular. They took the crowd with them as they built up to their wall of sound crescendo. They were closely followed by the versatile Beck. Without blinking, he switched from dance to soul and folk, accompanying himself on acoustic guitar and harmonica. Headlining the previous night, Linkin Park vocalists Chester Bennington and Mike Shinoda made their presence heard from the second they got on stage. 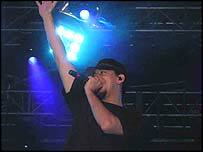 Mixing nu-metal and hip hop, they worked the crowd as they leapt around the stage. In the BBC Radio 1 tent, melodic indie Scots the Mull Historical Society looked like they were going to melt under the stage lights - but singer Colin MacIntyre has his own kind of coolness. Perhaps the most incredible sight of the festival was Polyphonic Spree from Texas. Around 22 members dressed in white robes jammed onto the Radio 1 stage. Armed with a violin, clarinet, brass section and a choir, their music recalled the psychedelic 1960s as singer Tim Delaughter led his merry throng. Another group on a nostalgia trip were The Darkness. Looking and sounding like 1970s glam rockers, they brought Friday afternoon to life as the sun began to shine. One man who has lost none of political passion over the years is Billy Bragg. He sang about the Iraq war and told about how much he was looking forward to next year's 20th anniversary of the miners' strike. He even sang a few songs too. On Sunday, old took on nu in the metal stakes, with veteran monsters of rock Metallica coming off best. They performed good, old-fashioned heavy rock with accompanying fireworks and songs with titles like Seek and Destroy. 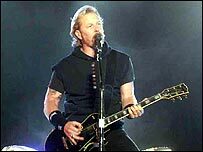 With his Asterix-style moustache, singer James Hetfield charged around the stage like a Gaulish warrior on magic potion. 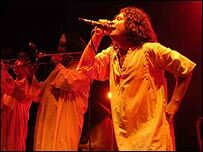 But he was polite enough to thank the ecstatic audience for staying with them throughout the band's problems and line up changes. There can be no doubting the commitment of young Canadian punk pretenders Sum 41 while California's System of a Down gave an eclectic performance. One moment they were playing nu-metal and screaming out rap - the next they were playing Eastern European rhythms recalling their Armenian roots.